Ok, so not quite a typical Weather Whys column this week. But Tom had mentioned we received a couple questions about it. I will preface this article by saying that this is strictly my own opinion and experience, independent of my current employment and previous employment for that matter. 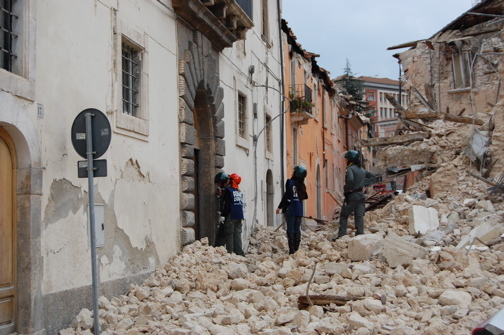 First some background: If you had not heard, six Italian scientists who did not accurately predict the 2009 L'Aquila earthquake, were convicted manslaughter in an Italian court this week. You can read more about it here, here, here, or here. I'm not going to recap much about this, as the verdict speaks for itself. My thought is: Most of us in America understand that natural sciences are often unpredictable and challenging. The joke of course, is that we can be right half the time and wrong half the time and still keep our jobs as meteorologists, for example. I hate that criticism very much (because it's false), but the truth is that, yes, in most cases, you will have job security as a meteorologist. If you are with a business or utility and costing them or their clients big dollars, yes, you could lose your job. On TV, unless you pull a busted forecast of Biblical proportions, you're probably safe. Notice: In none of these cases are you at risk for jail time. The Wall Street Journal has a nice article here as well about the aftermath of this. Now, the scientists did hold a news conference the week before the quake and announced that (via the WSJ article): "there was 'no danger,' calling it important to 'remain alert, without panicking.'" There had been several small quakes that ended up being foreshocks to the main March 2009 event. They did caveat it obviously, but the only thing they're really guilty of here is a poor choice of words and poor communication. The fact of the matter is: There is absolutely no way at present to predict earthquakes. We can make assumptions, we can draw conclusions, but there is simply no method rooted in science that works on a consistent basis that would allow us to predict an earthquake of any magnitude, let alone how strong and exactly where it would break. From the meteorologist's perspective, we all know that weather, while very predictable at many different lead times, is a very inexact science. Lead time on tornado warnings is 10-20 minutes in many cases now, which is considered phenomenal. But we know that wobbles and shifts in track mean those warnings may not always be spot on. Hurricanes work this way as well (remember how many people thought Isaac was headed to Tampa initially?). But it is well known here that this is an inexact science...therefore, the only liability on a meteorologist is to do the best he or she can. Sometimes your best isn't good enough and you will be wrong. In occasional cases, the entire forecasting community gets it wrong. Surprises can still happen in weather, and we learn from them. A report recently came out from the NWS that said they could have done a better job making the inland flooding risks associated with Hurricane Irene more abundantly clear. We all understand that, and we learn from prior mistakes. In seismology and to some extent volcanology, we simply do not have the experience, data, clues, or resources available to predict when a big one will occur...or when a small one will either. A book has been written on the subject of earthquake forecasting. I have read excerpts of this, and it is interesting. Perhaps the judge in the Italian job should read this book. The bottom line: Here in the US it's well understood. In the WSJ article, Mike Smith, a meteorologist, mentions that several suits have been brought against the NWS in past instances for mishaps. None have won. It's tough to fight the government and win, but I imagine a meteorologist in a private sector business would have similar success in defense of their forecast. Overall, the Italian verdict is more scary than anything. And I would not blame Italian scientists in all field for keeping more close to their vest now because of this. Thankfully, here in America, we don't need to worry about this...at least at this point. But if we were to ever, you can bet many meteorologists will find livings in other careers.